I am a bad disorganised sewer. I have not finished my to do pile. I keep starting more things. My fabric is in random heaps in the spare room. I have not sorted out my hardware issues and have written draft blog posts which I can’t upload the pictures for and started yet more blog posts using rubbish pictures but haven’t finished them. I was going to get organised (sewing wise at least) and make myself some trousers back in October. It’s now nearly the end of November and I’m thinking about blouses. I blame Erin from Seamstresserin as she keeps writing about bow neck blouses of every kind imaginable for her sewalong. Not that I’m tempted to try a bow neck blouse at all as they’re really not my thing. However I have been tempted by all the lovely Wiksten Tova blouses out there in blog land, there are too many to know where to start linking to. So tempted that despite my reservations about whether I’m the right shape to fit in suit one I went ahead and bought the pattern to celebrate finishing my curtains (by far the bulk of the remaining pile) although I had to use my mum’s printer to print it out. In the end I was swayed by the fact that I think the pattern is a bit like my favourite blouse, so has potential. Wanna see? It’s all floaty in a gauzey soft cotton fabric witha subtle little print on it and it’s floaty without being tent like and Holy Moly that keyhole neckline thing has a bow. A shoestring bow maybe but it’s a bow. Where did that come from?! How did I never notice that? Anyway, I like the collar on the Tova and I have a large piece of plain blue knit fabric from the scrapstore that I’ve used a corner from to make a toile/muslin in which has the added bonus that I won’t need to bother about finishing the seams. So I just need to match these pattern pieces up from my printout and …. hold on, I can match the little number triangle OR the edge of the pattern pieces OR the edges of the rectangles, but not 2 of them, let alone all 3. Oh well, I’ll bodge it together and soldier on. Right now to cut out in my blue fabric. Hang on, this fabric, err, there’s not very much of it and I seem to have used over half of what there was. There is nowhere near enough to make a blouse. Ok, I’ll rummage upstairs. Except I don’t make clothes for me so there is nothing suitable in my fabric pile. Except maybe this that I picked up from the scrapstore for £1, which horror of horrors is pink. Ok, I can do pink, it’s just a toile after all. Next, cutting out, ok. Put on plackets, fine. Attatch to front piece. Hmm, I’ve attached it inside out, which is even more obvious as I couldn’t be bothered to wind a pink bobbin so there’s the white reverse of my topstitching showing. And a hole on one corner where I failed to attatch the inset correctly. This needs needs redoing. 3 times . Hmm, this fabric is loose weave, it frays easily and pins leave holes. Ok, so the front is bodged together just about assembled. Maybe I’ll just sew it to the back to try it on. 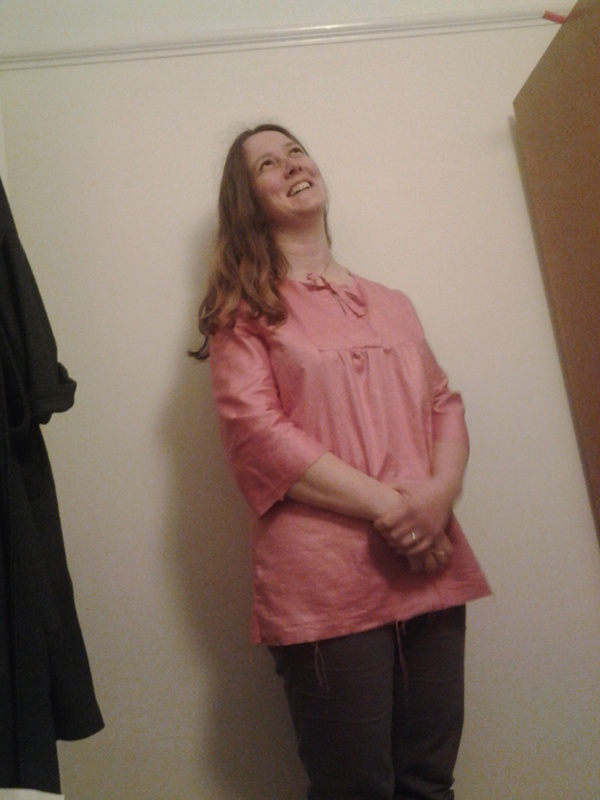 Pink is not my colour, this is definitely a toile. 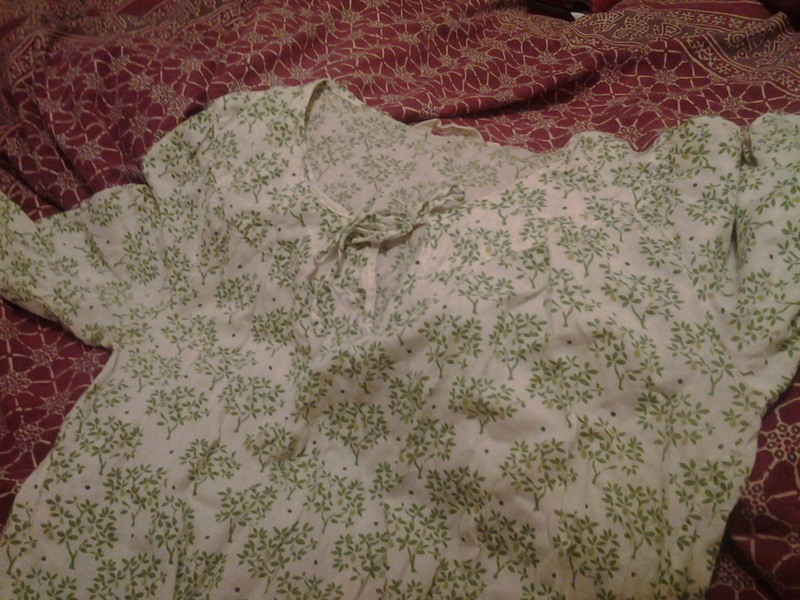 I’ll try and take in the back, which appears to be a couple of sizes bigger than the front and add the sleeves. Hmm, I’ve added one sleeve inside out. Never mind, I can still guage the fit this way. Hmm, I wonder if I could, yes I might…. Behold (but not too closely) the prototype bow neck Tova. I bet this has been done before, to solve the gaping placket issue, but I can’t find an example of it. I have found a collarless Tova (done properly with bias binding not just turned over and hemmed like this one). Actually I kind of like it and I think the unfinished wider sleeves balance it nicely. Shame it’s so badly made, not great fitting and pink. Seriously, I’m not convinced about the way the inset sits on my bust. Although hubby thinks it’s fine. Also, the upper back and the top of the sleeves feel a bit tight so I definitely don’t want to try the full bust adjustment if that results in a tighter sleeve cap. Which is a shame as I saw some great fabric for making a Tova dress (with a collar) that I had imagined I could rustle up for my weekend away on Friday. I think I need to let my subconcious mull over next steps for a while, but I hope there will be a well made properly fitted version sometime and maybe a bow necked version one day too. And if I do try again then I need to start before 9pm, takemy time, concentrate and do itproperly! If not, my mum might have the pattern as she was eyeing it up! This entry was posted in Uncategorized and tagged blouse, bow, bust, collarless, experiment, muslin, neck, tight, toile, Tova, Wiksten, XL. Bookmark the permalink. I’m impressed. Looks good! Keep up the good work. I have started making a toile for a blouse. I bought a pattern, it’s all cut out, I have begun assembly. There may be an hour or two free at some point next month to do the next step. maybe a new blouse this time next year?! Good luck finishing it. What pattern are you using? I have to really go for it and steam on through to the end or things are in danger of being put on one side for years.